Childs, Eric "Stumpy Joe" (1945-1974): Former Wool Cave drummer became Taps second drummer in 1969 after John "Stumpy" Pepys died in a bizarre gardening accident. Derek remembers Childs as having "big hands, big feet, big heart. Small lips. Thin hair. Big ears. That really says it all." (IST) Childs would perform on four Tap albums before choking to death on someone elses vomit in 1974. Who produced the vomit remains shrouded in mystery. Nigel: "You cant really dust for vomit." Inexplicably, the band would later claim he died of a melanin overdose. (STR) And even later, when asked about the investigation into Childs' death, Derek reported: "Last we heard, they had conducted DNA tests on [the vomit]. The only results to get back to us was that, on closer analysis, it may not have been vomit." 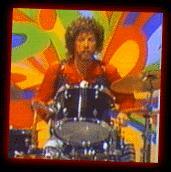 (PB) An early Tap session drummer, Childs played on "(Listen to the) Flower People" b/w "Rainy Day Sun," although he didnt join the group officially until 1969.